What better way to enjoy the life of your four-legged family member than with Dog Personalized Wood Picture Frames. This beautifully engraved picture frame makes a great Dog Lover gift suitable for a personalized birthday gift or endearing memorial gift. 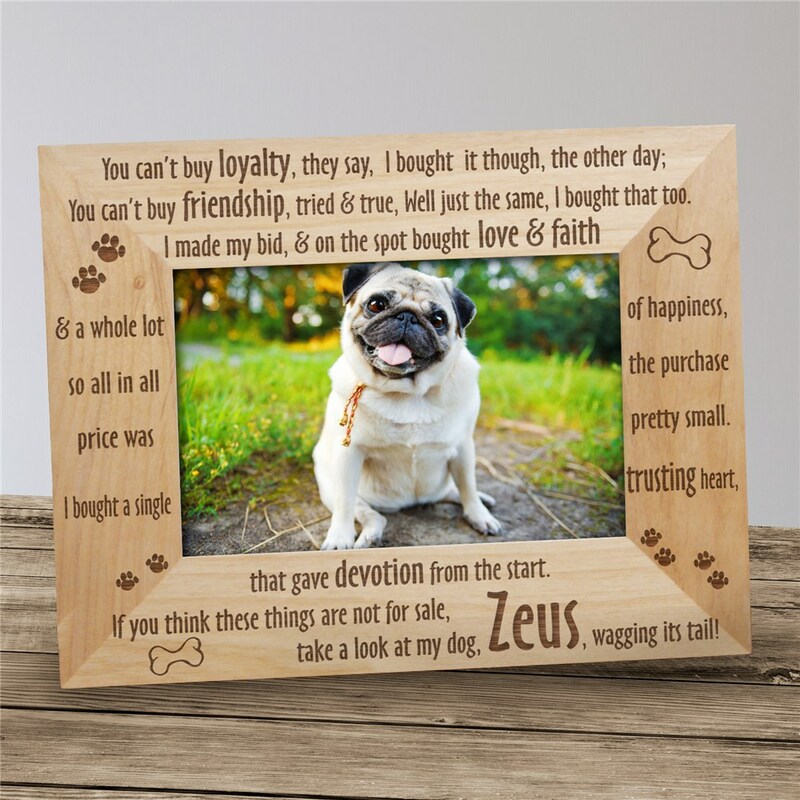 Our Loyal Dog Personalized Wooden Picture Frames come in three sizes, please choose from, 4"x6", 5"x7" and 8"x10". Easel back allows for desk display. Includes FREE Personalization! Personalize your Dog Photo Frame with any pet's name. This is the cutest frame I've ever seen. I've gotten so many compliments on it. I am totally happy with this frame. The quality is great and it says exactly what I wanted it to say. You can't buy loyalty, they say, I bought it though, the other day; You can't buy friendship, tried and true, Well just the same, I bought that too. I made my bid, & on the spot bought love & faith & a whole lot of happiness, so all in all the purchase price was pretty small. I bought a single trusting heart, that gave devotion from the start. If you think these things are not for sale, take a look at my dog,"any name here", wagging it's tail!